Meet Rosa Chang, owner of Blossom Inspirations. 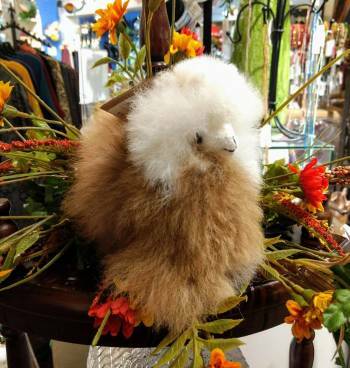 She'll be showing off incredibly soft alpaca animals, beautiful knit crafts, and festive gourd ornaments made in Peru. Your purchase helps families earn economic independence, social well-being, and self-esteem. This pop-up shop is after-hours as part of a ticketed event. You can get your ticket to our annual Holiday Decorating & Entertaining Seminar HERE. Rosa Chang is the little engine that could, can and will do! As the owner of Blossom Inspirations, some days she is designing products, others she is managing import/export duties, networking, and selling. She also chases her two daughters around the house and swims ridiculous distances in the pool, lake, and ocean. She founded Blossom Inspirations in 2009 with a desire to mutual benefit everyone involved in the production and sale of eco-friendly, fair trade products. The Blossom Inspirations team works directly with Peruvian artisans, knowing them by name and visiting them at their homes and workshops. Their products are designed and produced to positively impact Peruvian artisans, wholesalers, retailers, consumers, and our environment.